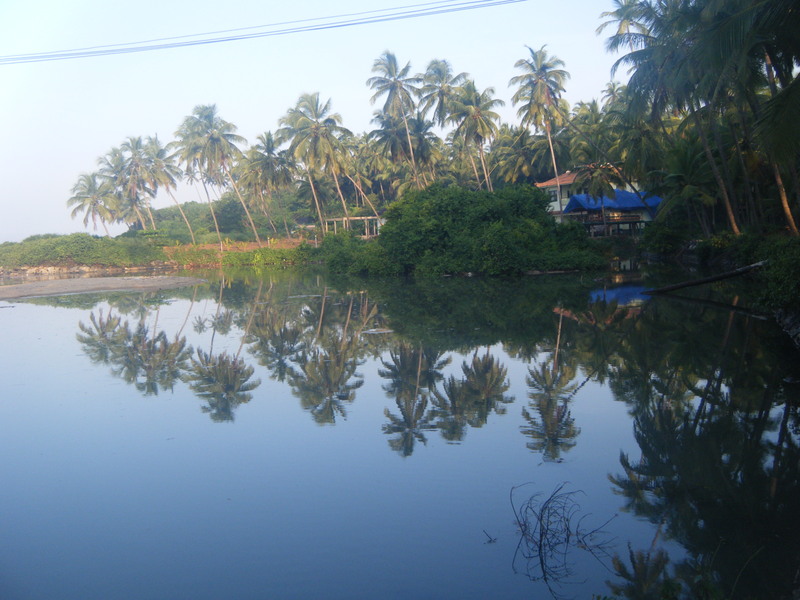 Between the beach and the backwater is Blue Mermaid, our host at Kannur, Kerala. Krishna was an anytime errands boy for everyone. He could fetch or fix anything anyone at the Homestay wanted. A bunch of techies from Bangalore, out on a boys weekend out, wanted a case of beer bottles. Kathy needed help fixing her baby’s mashed potato meal; we had Krishna tell us how to get solar heated water running in our bathroom tap. And then the electrician from town (some 7 kms away) who came to do a repair job in the afternoon had left without connecting all wires. The snag was discovered only after dark and frantic calls to the electrician went unanswered. When they failed to get someone else, Krishna, though not an electrician, offered to give it a try. His effort worked, and that was how we got the power back that night. Set up a couple of years back the 8-room Homestay facility – Blue Mermaid – is comfortable, if you can put up with occasional power failure – declared and unscheduled. Hostess Indu Pradeep Kumar says they have plans for back-up power generator to ensure uninterrupted power supply. I don’t think they have WiFi coverage, though they happily let you use their office desktop. I made full use of Indu’s office computer to upload loads of pictures from camera to my pen drive. For a place that is still a work in progress Blue Mermaid attracts a steady flow of guests, notably from abroad. 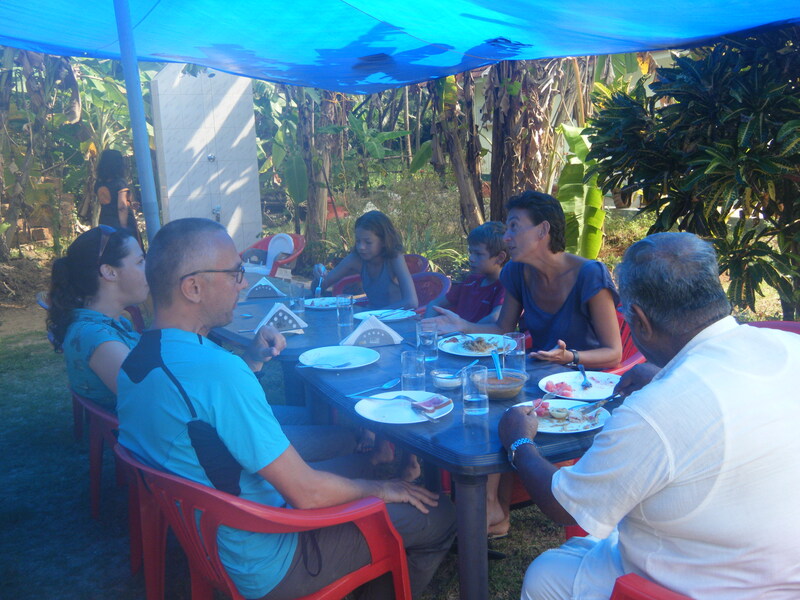 During our two-day stay there, we had as guests a family of six from Paris, a British couple with a 16-month old son, and a group of techies from Bangalore. A UK tour operator’s rep. on inspection trip of homestay facilities in India was given the only available bamboo cottage, normally reserved for honeymooners . India, he says, is getting to be , increasingly, a preferred destination for tourists from the UK and Europe. Dining table chat that went on long after our plates got empty was, for me, the CSP (core selling point) of this seaside homestay at Kannur. – Photo – Lakshmi Krishnan. If I were to list Blue Mermaid’s CSP (core selling proposition) I would place dining table chat with guests above all other factors. Wife and I spent hours at the table, chatting with the French family of six , of which four are children aged between 13 and five. They are on a 10-month vacation, away from home in Paris. The French couple have taken long leave from office – he is a company executive, and she is into advertising. Their children carry their school in an iPad. They get their course material online; and the children have permission from school to do their term exams online, from wherever they are. The 13 year old appeared for her last exam while vacationing in Goa. She gave a 0ne-hour biology test, online, during our stay at Blue Mermaid. Her father says he can’t remember the last time he had spent so much and such good time together with his family, uninterrupted by office work – ‘on leaving Paris I handed in to my office , not only my car key, but my Blackberry as well’. They told him he could keep the B’berry – ‘I told them, no, thank you’. The company executive from Paris says he has been able to do very well without a phone and the Internet. If the French couple with whom we spent so many hours talking remain unnamed, it is because it didn’t occur to either of us to find out each others names. We exchanged e-mail IDs, just in case their wanderings brought this French family to my patch of the world, Chennai. With the British woman, Kathy, we talked of bamboo bikes. I mentioned about my meeting in Wayanad with bamboo craftsman Lenin , and our chat on the possibility of fabricating bamboo-framed bike in his workshop. Kathy evinced such interest that she went into online research on bamboo bike manufacture in the UK. Marketing is not Kathy’s line of work. Having spent the past year in setting up an NGO-run school at Palladam, near Coimbatore, Kathy and her husband are on their way back to Britain. Meanwhile, she is doing a course on partnership counseling. Kathy referred to the need for ability to give a hearing to others’ viewpoint, to sustain any relationship , particularly, of man-wife relationship. At a study group in the UK, a group of young married couples were tested for their propensity to listen to one another, at least for 60 seconds without interrupting. It found the participants averaged no more than 17 secs. of uninterrupted listening to each other. I asked if Kathy, as partnership expert, had any advice to offer to a couple, married for four decades (42 years, said wife, correcting me) Kathy said she wanted to interview us, to know our secret. If every marriage lasted as long as ours, Kathy would find herself jobless. Which is , presumably, why she looking at the UK for a career. As she said, nearly 50 percent marriages in Europe ended in divorce. Indu, the hostess – 2.31 mins. Krishna, anytime errand boy – 3.10 mins. Techies, weekending – 1.28 mins. Kathy & Rex – toddy-tasting – 4.05 mins. Lenin, bamboo craftsman – 1.03 Mins. Kathy’s take on bamboo bikes – 5.47 mins. Stony path to the beach – 0.38 min. Stonewall view of beach – 2.07 mins. Setting sun – 1.11 min.